Being an entrepreneur is hard work. Long days. Little sleep. Facing failure over and over again in the hope of achieving that major breakthrough. Tack on being a native-Spanish speaker and a full-time student, and you’re also dealing with a cultural learning curve and limited free time. 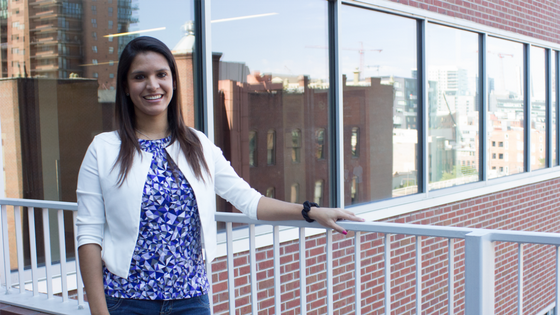 Ferrua, a Peruvian international student, came to CU Denver to pursue a master’s degree in International Business with a specialization in marketing and management after a seven-year career in the textile industry. After getting encouragement from Manuel Serapio, associate professor of International Business, Ferrua did just that. She entered her business concept, Kiddin’, into the Jake Jabs Center for Entrepreneurship’s fall 2016 Business Plan Competition, THE CLIMB. 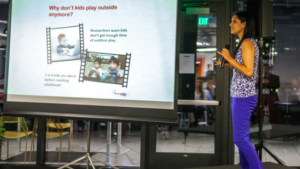 Ferrua showcases her Kiddin’ shoes at THE CLIMB | Business Plan Competition in fall 2016. 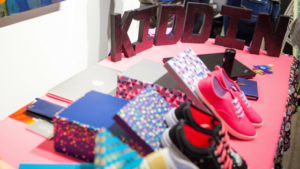 Kiddin’ is a shoe company that provides innovative and high-quality sneakers for children. The idea came from her desire to encourage children to maintain an active childhood in a fun way, as the shoe itself contains color-changing properties when exposed to sunlight. “Children these days are not as active as they used to be, and I want to get kids back outside,” Ferrua said. She was chosen as a semi-finalist for THE CLIMB and had only two weeks to develop her prototype. In front of the audience and judges, she demonstrated how the shoe changed colors with a UV ray. Although she didn’t make it to the finals, she had a great experience overall. Ferrua pitches her business concept, Kiddin’ at THE CLIMB. Since participating in THE CLIMB, Ferrua has incorporated Jake Jabs Center courses such as International Entrepreneurship and New Venture Operations & Project Management into her academic curriculum. “After THE CLIMB, I realized that every course I take moving forward should complement my business venture,” she said. In addition, Ferrua has attended different events and workshops hosted by the Jake Jabs Center that allowed her to network with local entrepreneurs and gain access to business resources she might not have discovered elsewhere. As if she wasn’t high-achieving enough, Ferrua serves on the Dean’s Student Advisory Council for the CU Denver Business School, is treasurer of the International Business Student Network, is a member of CU Denver’s Golden Key International Honour Society, and maintains a 3.9 GPA. She is also the 2017-18 recipient of the American Association of University Women (AAUW) International Master’s/First Professional Degree Completion Fellowship. The driving force behind her success is her parents. She says they taught her “the importance of creating a positive impact everywhere I go.” That mindset is what drives her to become a successful, ethical, and socially-conscious entrepreneur. Ferrua hopes to bring Kiddin’ to market within the next few years. “I am working on obtaining the patent, want to eventually raise some money through crowdfunding and want to apply for an organic label,” she said. To achieve this, she wants to use only organic textiles when manufacturing the shoe. “I want my textile partners to be from Peru, because Peruvian cotton is of great quality. Due to my previous work experience in the textile industry, I have an idea of which companies to work with,” Ferrua said.